Monday: For some reason, the week nowadays seem to begin with Rjåhornet. But OK, it’s not the worst place to spend a Monday afternoon. 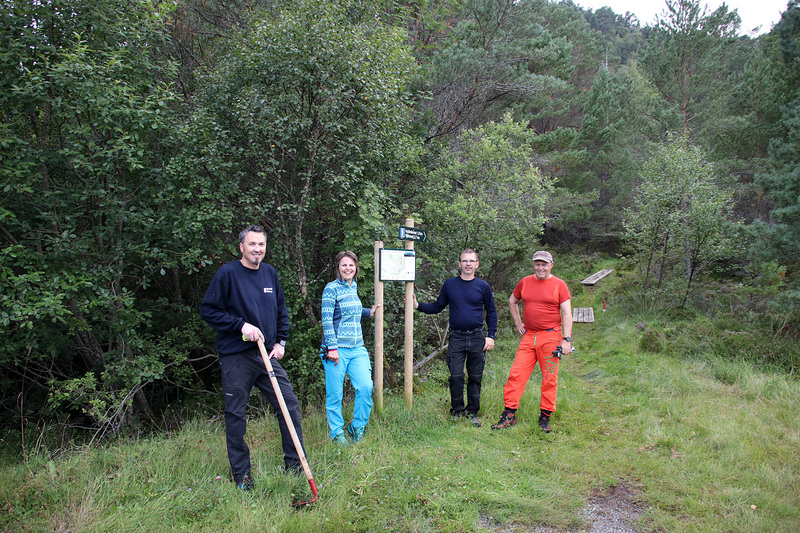 Tuesday: Working with the local voluntary group “Turstiprosjektet Myrvåg/Tjørvåg“, deploying “wooden walkways” (in lack of a better word) at the start of the paths to Dyrkyrkja and Huldrehornet. 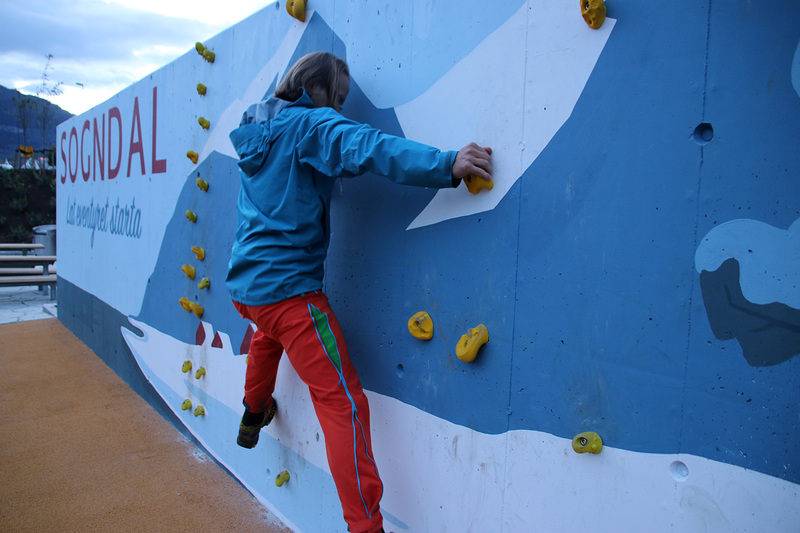 Nice “outing” with Jonny, Elin, Hans and Erling. This makes quite a difference, as the start of these paths are really, really wet after rain. 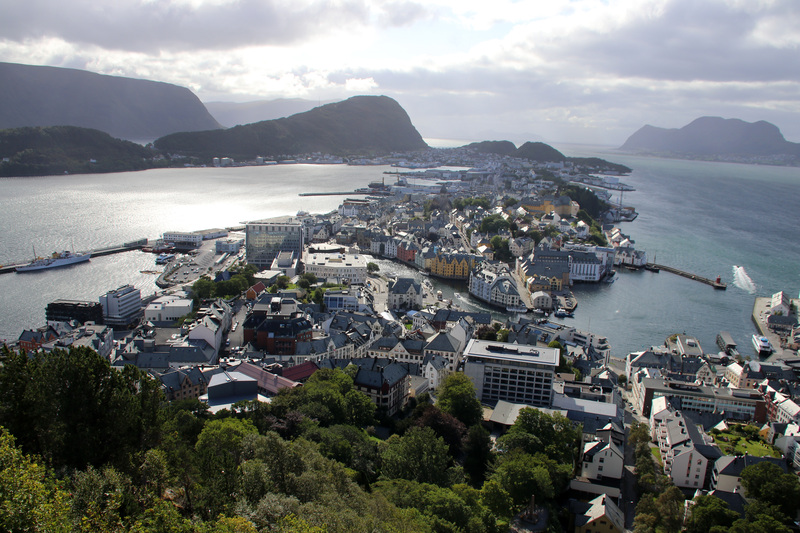 Thursday: Another day in Ålesund, and as I start just after 7am, I can leave with 3pm with good conscience. I hate the traffic. It’s a jam in and out of Ålesund, but I can get to Ellingsøya island without any jam at all. 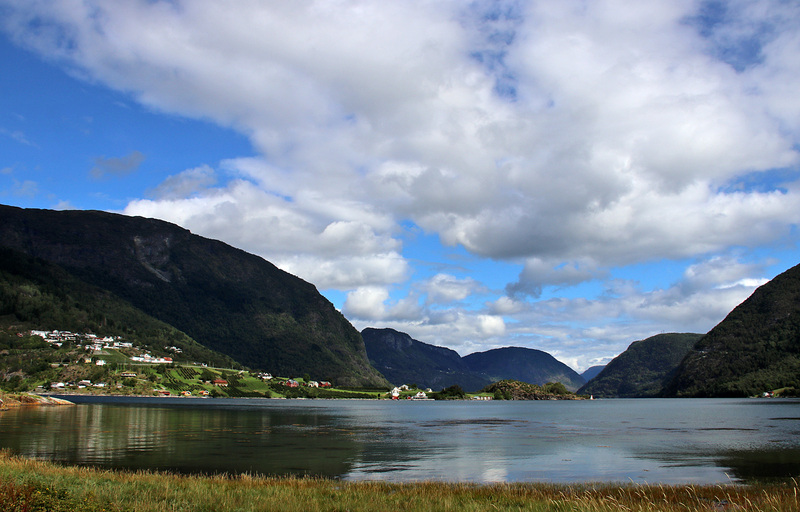 So, today I drove to Ellingsøya and to the north side (near Timbreskarhaugen) and parked by the soccer field. 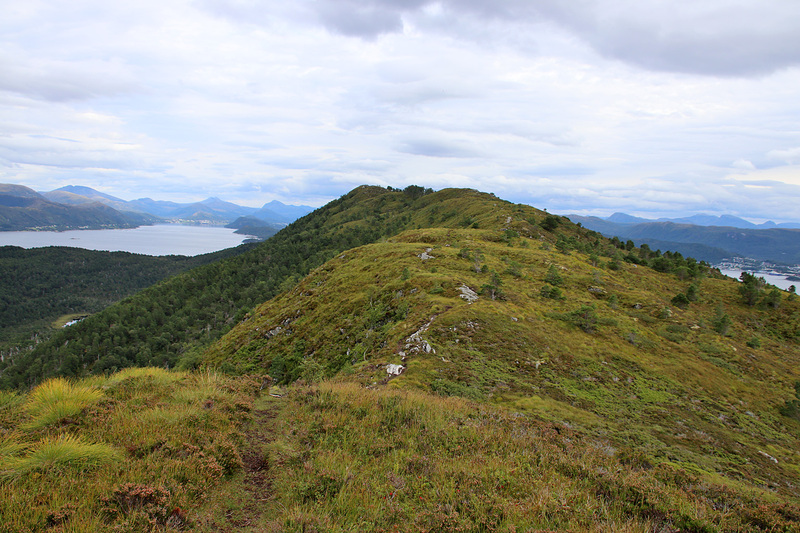 From here, I followed the tractor road up to the Rørene – Myklebusthornet saddle, and followed the ridge path towards Myklebusthornet. From the top, I took a new route down. I continued eastbound until I was north of point 175m. 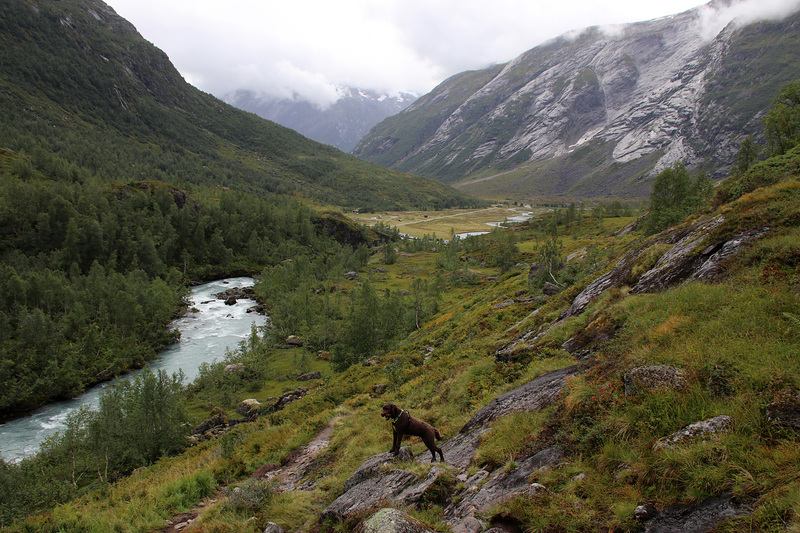 Then I descended off-trail into a small valley which eventually led me to the greater valley south of Haukåsen. 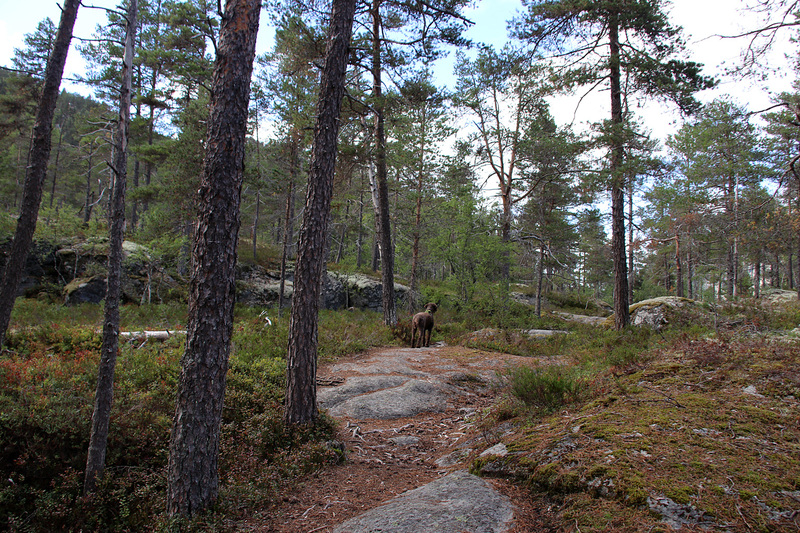 Here, I followed a forest path back to the starting point. 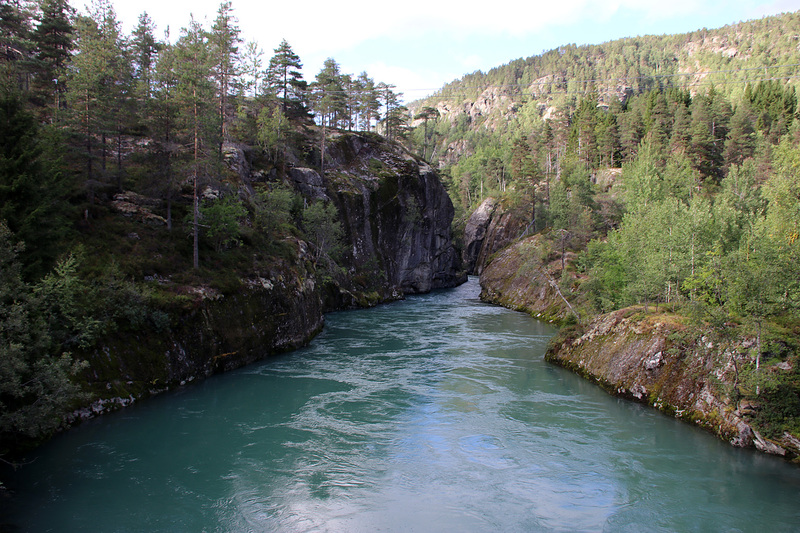 I made a mental note to come back and visit Haukåsen later this autumn. 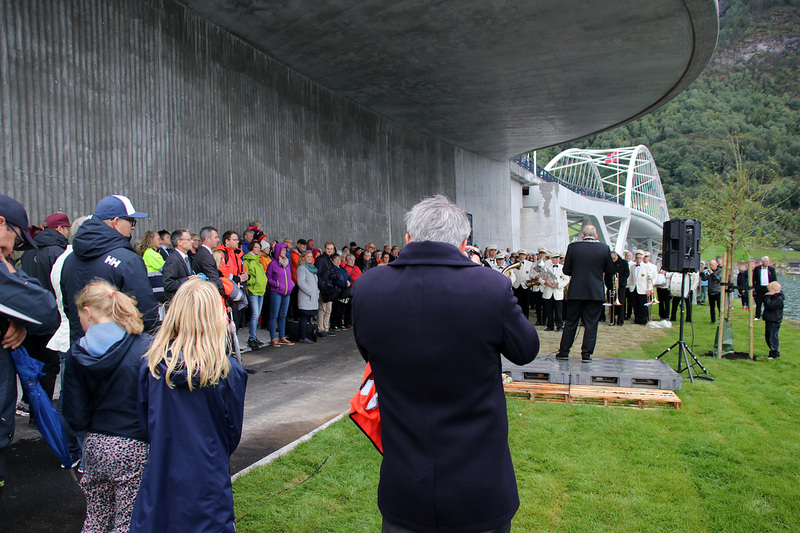 Friday: I drove to Sogndal to spend the weekend with Anne, and on Friday evening, there was a grand opening of the new bridge. 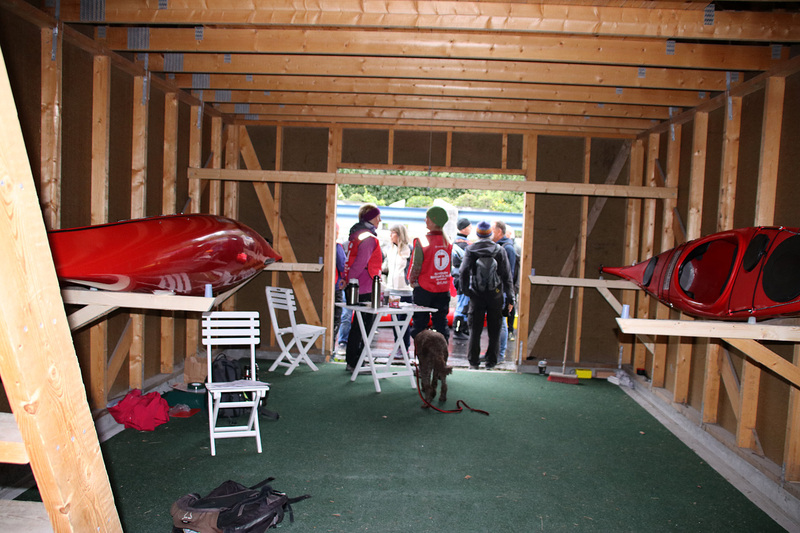 In addition, Sogndal Turlag was opening their “kajakk naust” (naust = boathouse). 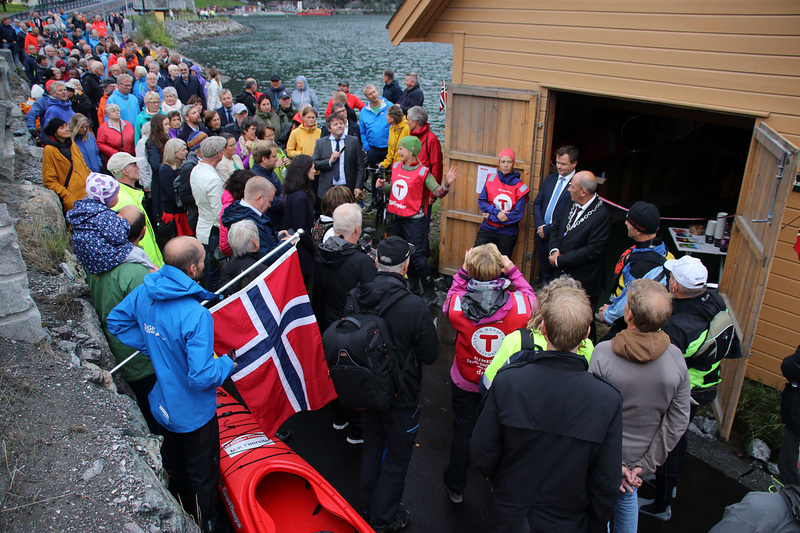 After the Mayor had officially opened the bridge and the new beautiful walkway along the shore, the Mayor and the General Secretary of DNT (The Norwegian Tourist Association) came over to officially open the boathouse. Anne did a welcome pitch before handing over to the Mayor. Anne (green hat) gives a welcome speech. My only link to this was helping Anne out with the online booking calendar. 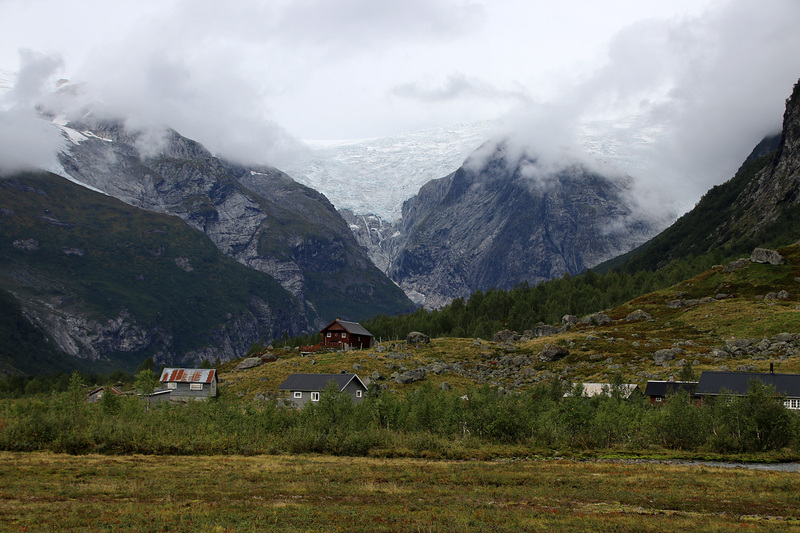 Saturday: Tungestølen is located at the foot of Jostedalsbreen glacier, and has been for many years (since 1910) been an important cabin (privately owned) for the local community and hikers. 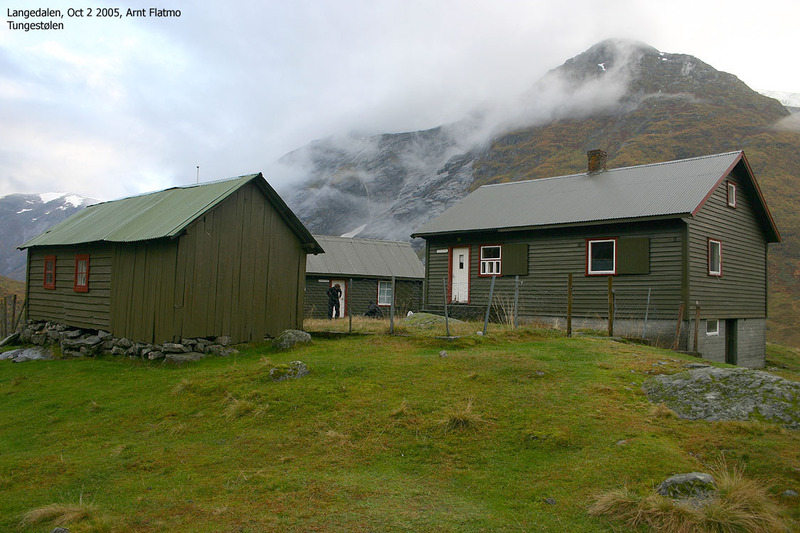 The cabin got obliviated by hurricane “Dagmar” in 2011, and since then, enthusiasts have worked hard to get funding for a new cabin. The hard work eventually paid off, funding got secured and the Snøhetta won the open design competition. And today, the foundation stone would be put in place. 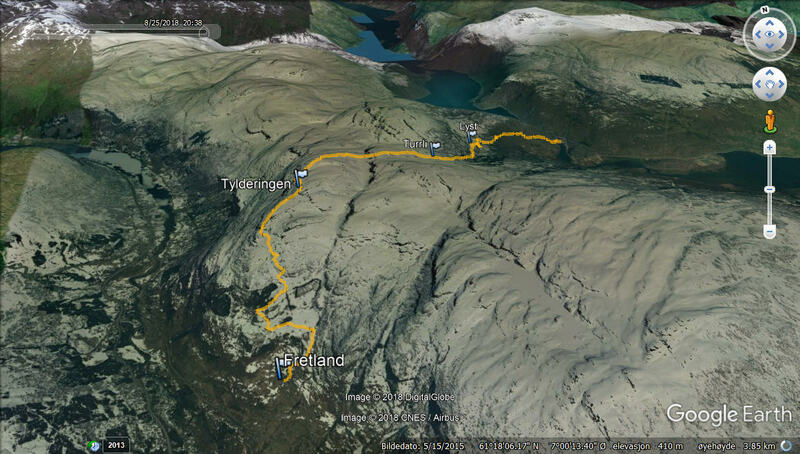 Anne and I arrived at Tungestølen a little early, so while she talked to people arriving, I took Karma on a quick walk in the direction of Austerdalsbreen. When I returned, the opening had begun. 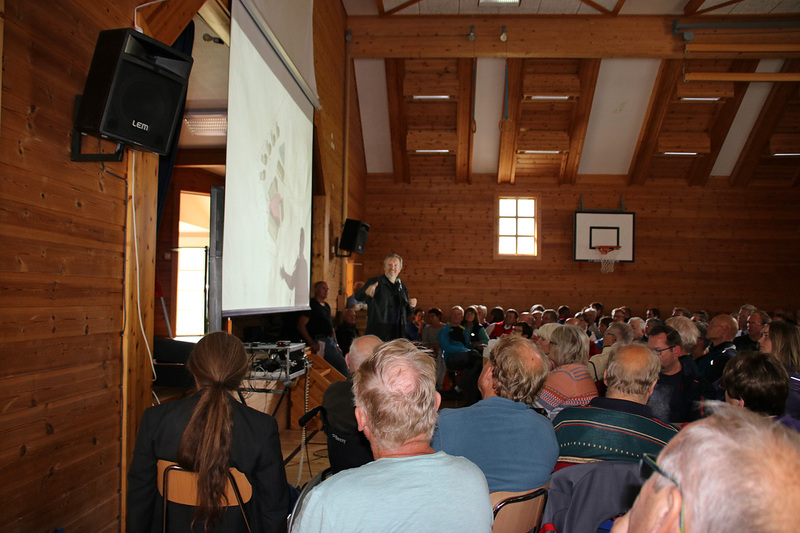 The speakers stood in line; Atle Hamar (State Secretary), Ivar Kvalen (Mayor in Luster), Nils Øverås (General Secretary, DNT), Ole Schanke Eikum (Luster Turlag), Anne-Marie Aamelfot Hjelle (DNT). Among others. I’m normally really not too thrilled about events like this, but I have some really, really good memories from trips near Tungestølen, so I listened with interest. 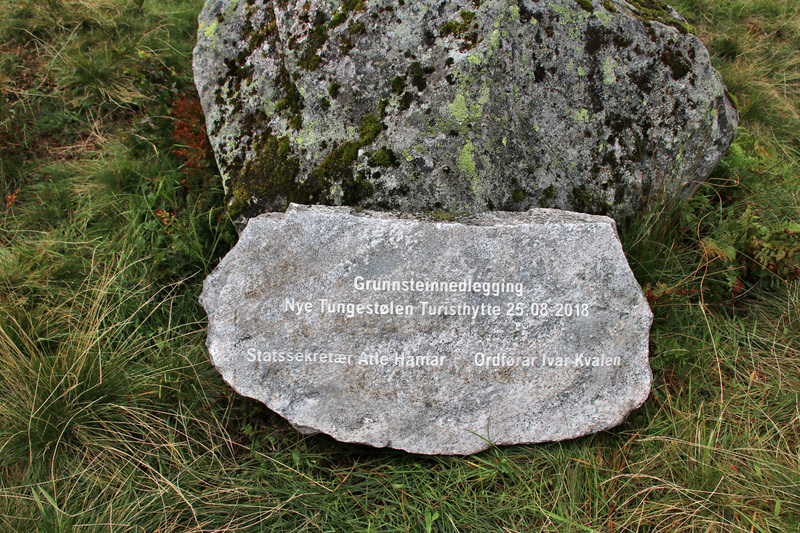 Eventually, the foundation stone was put in place and the new Tungestølen seems to have a bright future. 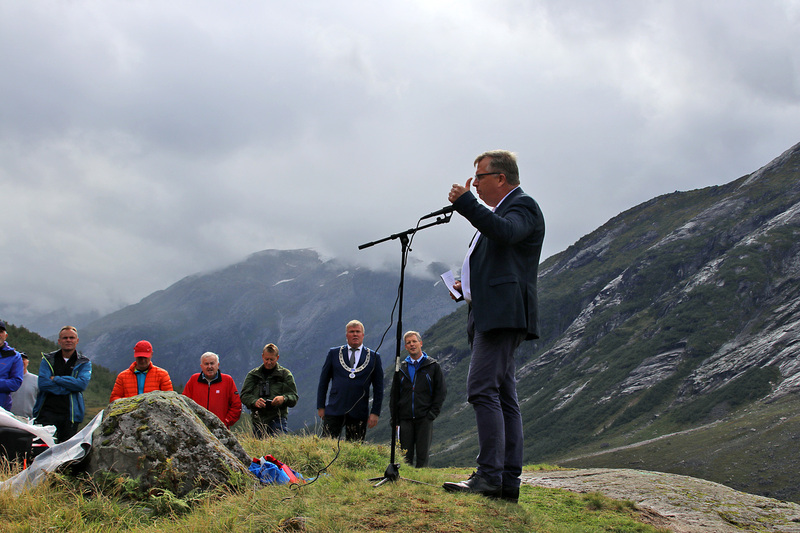 After this happening, everyone went down to Veitastrond where there more speeches, and at least I had to be there when Anne conveyed greetings from the Jostedalsbreen Glacier National Park Steering Board (or whatever it is called in English). Another speaker was Snøhetta’s co-founder Kjetil Trædal Thorsen, who gave an impressing speech. 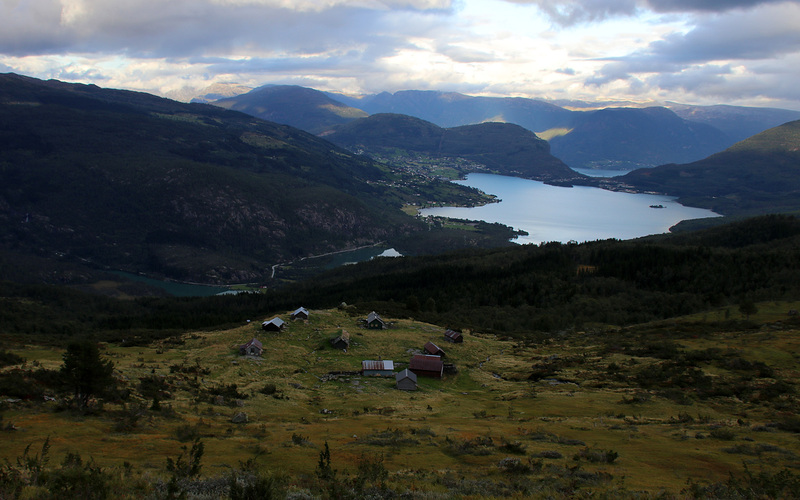 Still Saturday: After a long day in Veitastrond, we drove back towards Sogndal and I really felt for stretching my legs. All of a sudden, I figured that a hike from Soget to Fretland, via Tylderingen would be just what me and Karma needed. The time was 6pm, and I had perhaps 3 hours of daylight left. 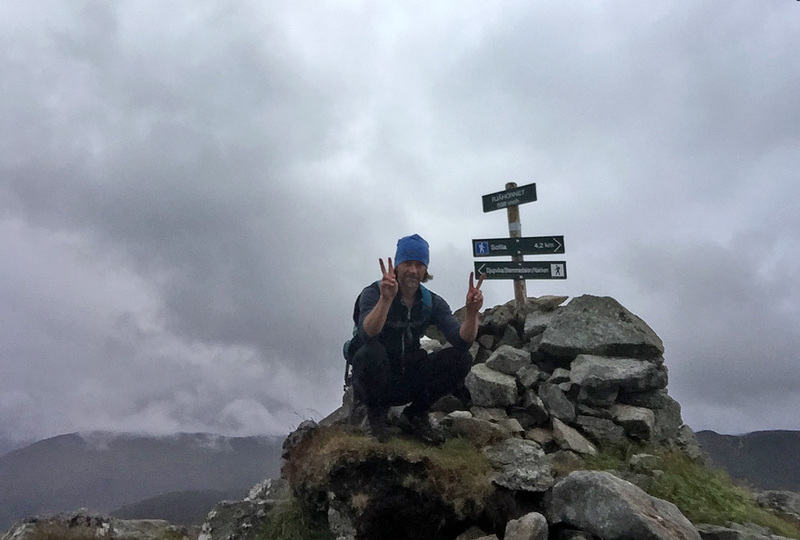 The distance wasn’t terrifying – close to 11km. 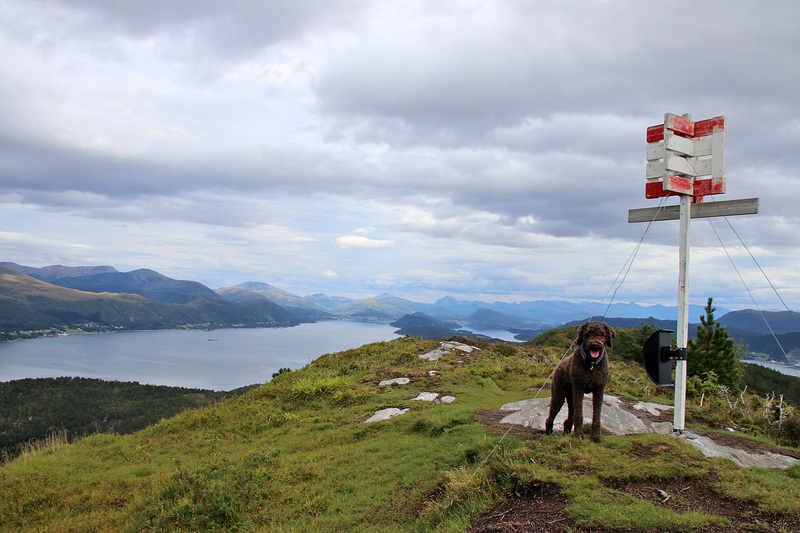 But I had to ascend almost 1000 vertical meters. Quick math suggested that this was doable within 3 hours. Anne dropped me and Karma off at Soget and drove back to Sogndal. It was a nice hike up the forest. Above Lyst, we reached a car road (not open for the public) and a signpost saying “Simosete, 500m”. I thought Simosete was half a kilometer to the north. 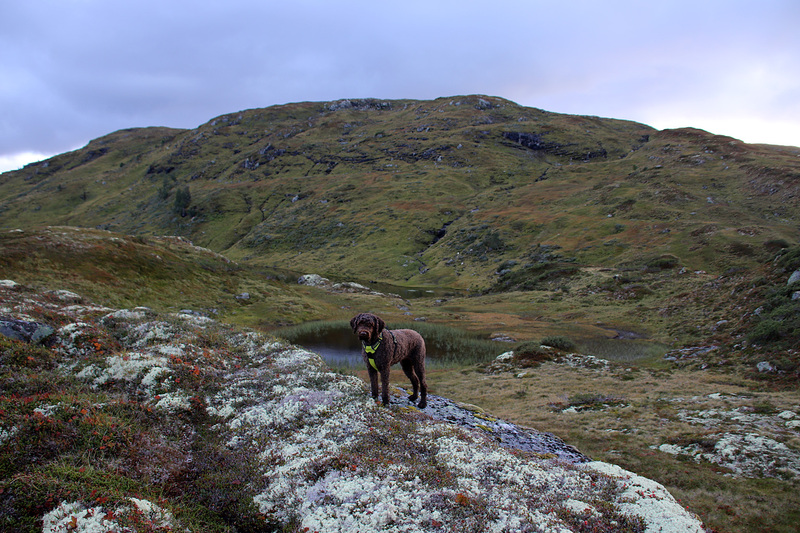 We continued up to lake Svartavatnet where we had Tylderingen ahead of us. 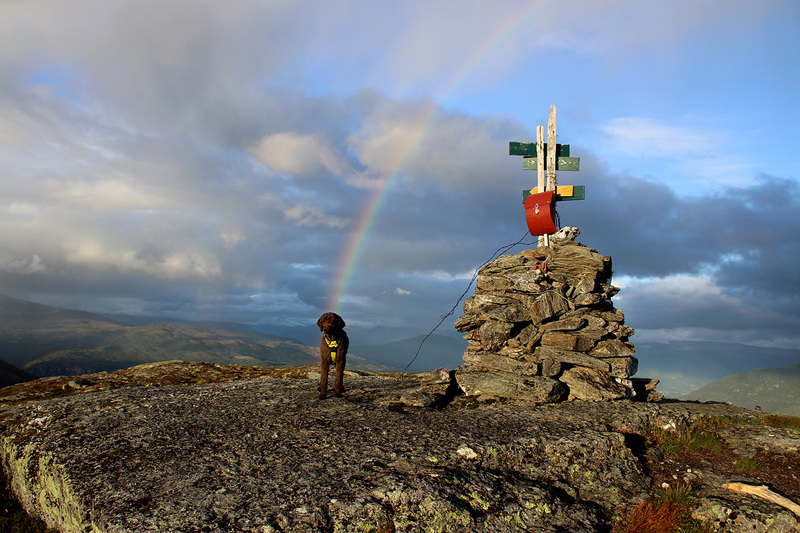 We reached the top of Tylderingen exactly 2 hours after heading out from Soget. Still on plan! 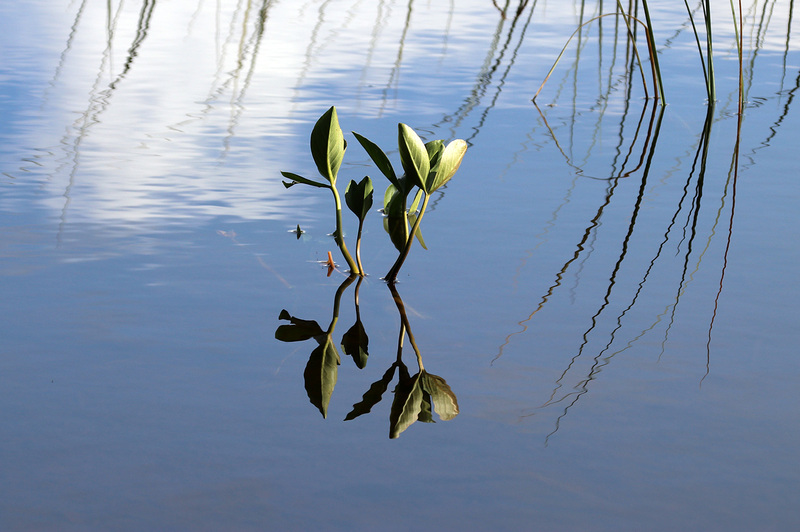 Sunday: My suggestion for the day was to go to Fimreiteåsen and visit Hønsaholten – a modest forest top that I still hadn’t been to. 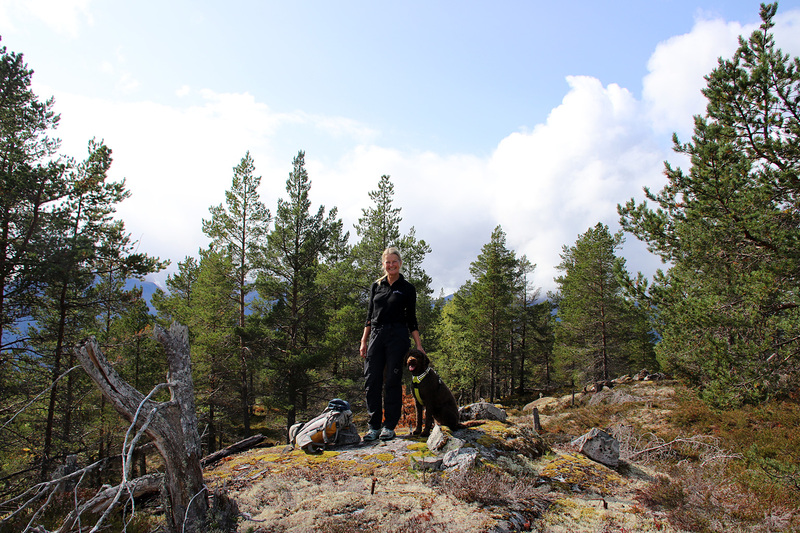 There is a protected area in this forest, so Anne figured that she could be there in official business. 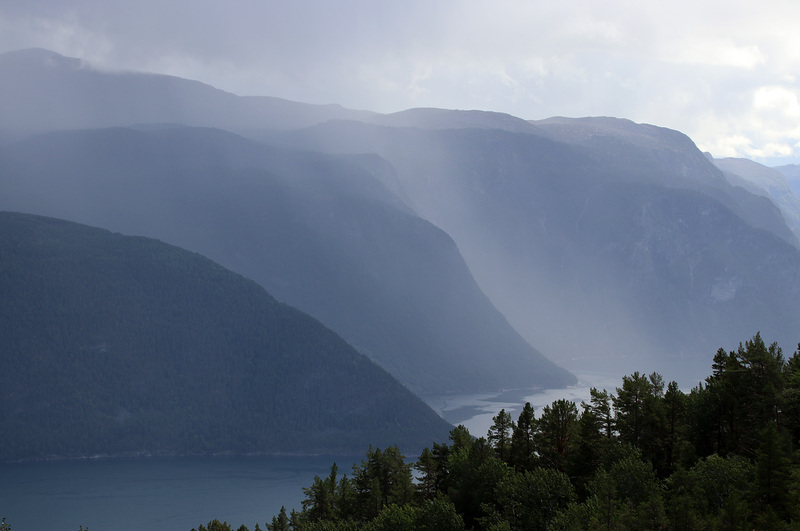 Which gave us the opportunity to drive her Park Ranger car up the private road up from Fimreite. 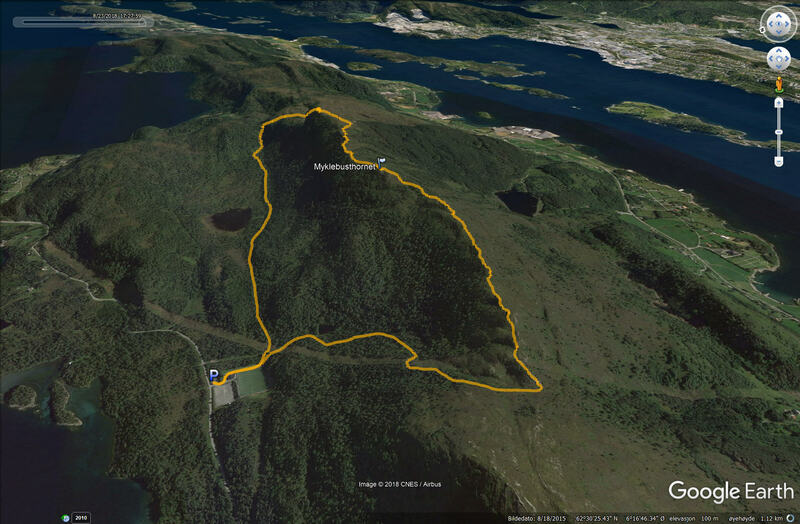 We left the car at the foot of Kloppadalen and headed up the forest road on the southeast side of the plateau. 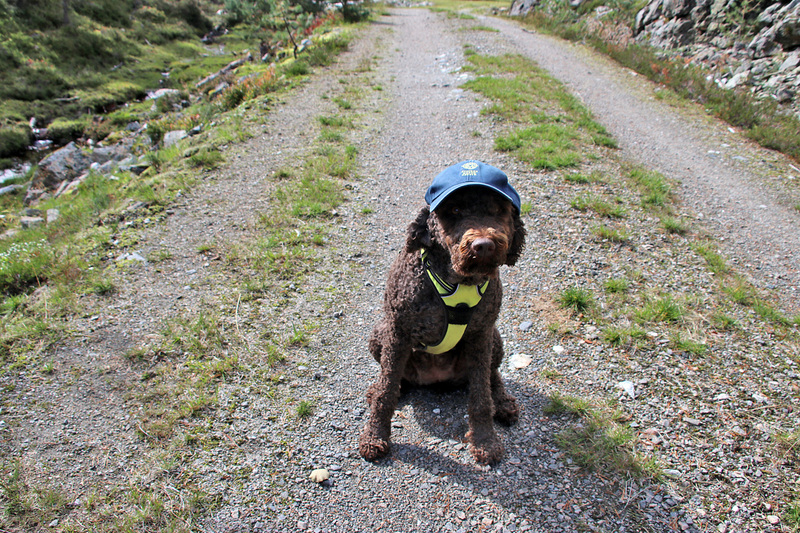 Dogs are of course great assets when it comes to park ranger stuff, so Karma was deputized for the day. 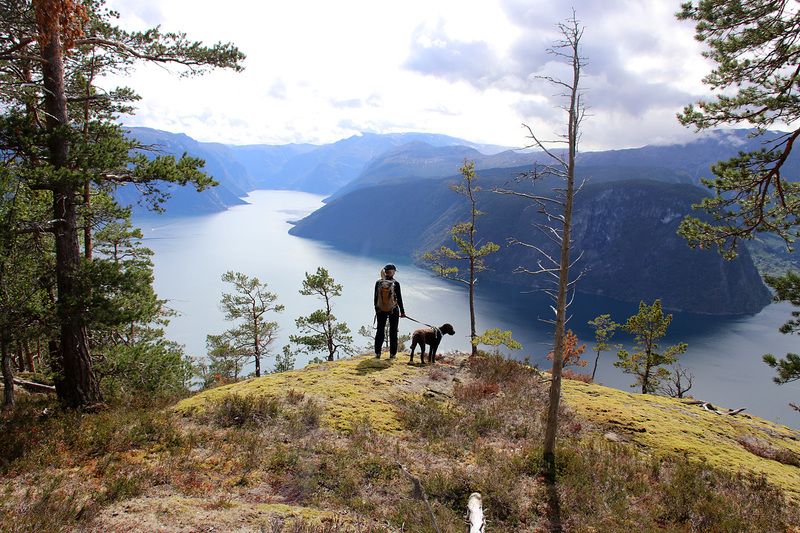 Eventually, we reached the end of the forest road and had a nice view towards Sognefjorden. You’re not supposed to watch *me*, Karma! 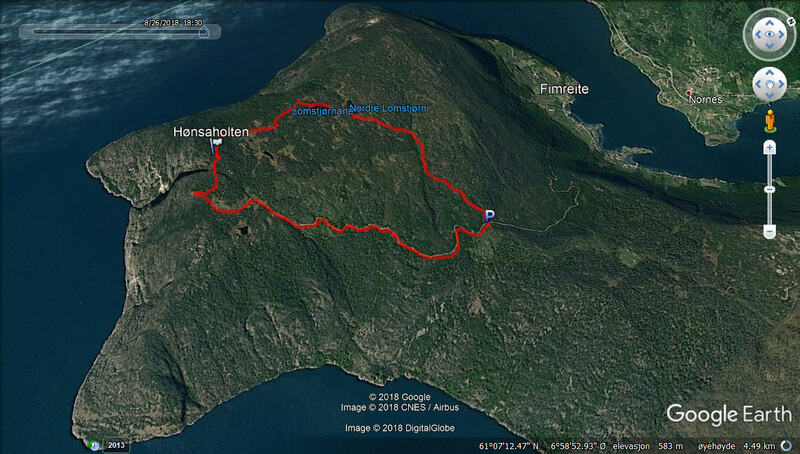 Then we sat course for *my* goal for the day – Hønsaholten. 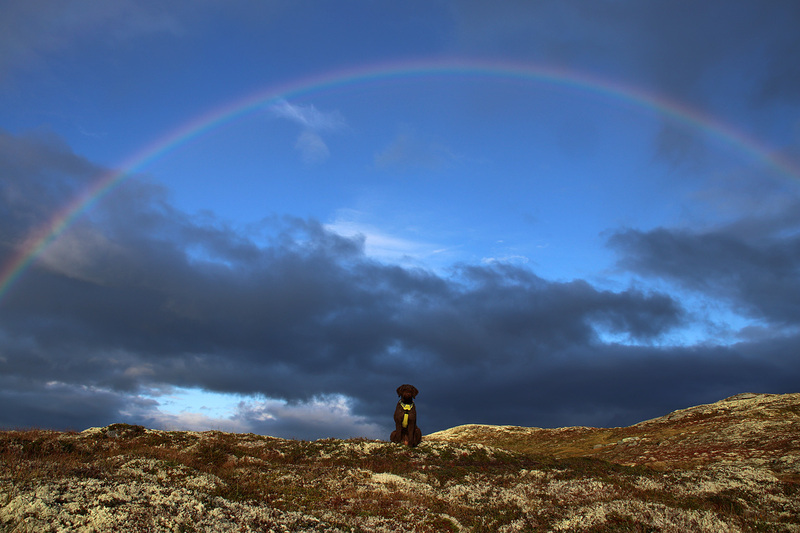 It was quite an anonymous top, but none of us had been there before, and we both enjoy visiting new places. 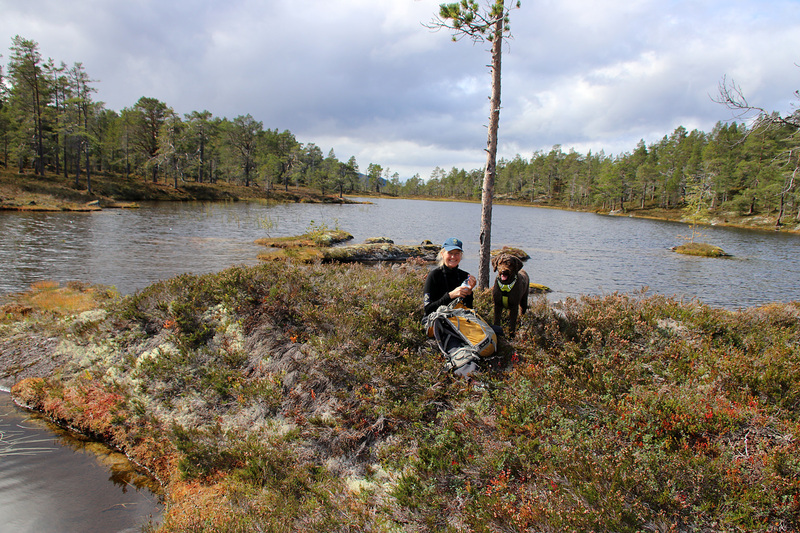 We sat course for the Lomstjørnane lakes, which were inside the protected area. 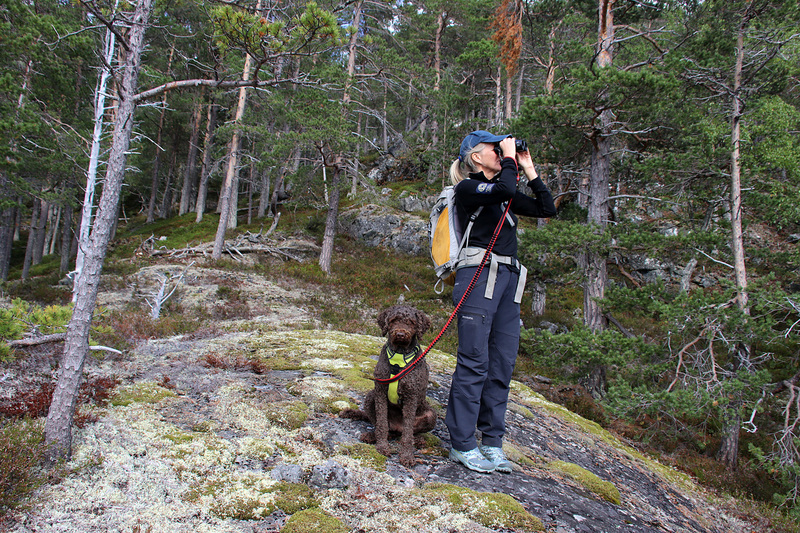 Anne was busy with observing birds and I just enjoyed being outdoors. We took a short break by the northern lake before heading back to the car. A very nice walk, it was!